The route one used to drive to reach what might be called the "old way" to Mt Mitchell has closed and no longer available to the public. Sooooooooo, we can no longer use the road. Please choose to use the "new way" to hike Mt. Mitchell which is from the West using parts of the Sugarloaf Mountain trail. Even though this is a difficult hike because of the rapid elevation gain, it seems the most difficult part of this hike was finding it. If it wasn't for a pink ribbon tied around a tree, I'm not sure if I would have found the trail head. As you drive up Forest Road 10, you will come to several steep switchbacks, then you will come to a level area where the road seems to break into many pieces. Take the first option to the right, then keep straight ahead at the next option. Watch for an old road on your right, with a one car parking area across the road on the left. Walk up this old logging road just a short distance, and then all of a sudden there you are on a real genuine trail! Now that you've found the trail, you will need to find the breath to climb this very very steep trail. In about a half mile, things level off to a moderate climb and from then on its not too bad. About a mile into the hike, you will cross a small stream whose canyon allows you a great view of Mt St Helens just across the way. A short while later you will come to a junction of another approach to Mount Mitchell. Keep straight ahead. Then you will begin to break out into more open areas. Up until this point you have been hiking in very dense timber, but now you will be more and more in the open. The trail is making its way around the south flank of the mountain for a southwesterly approach. The floral displays really begin to show, and you are treated to great vistas of points south. 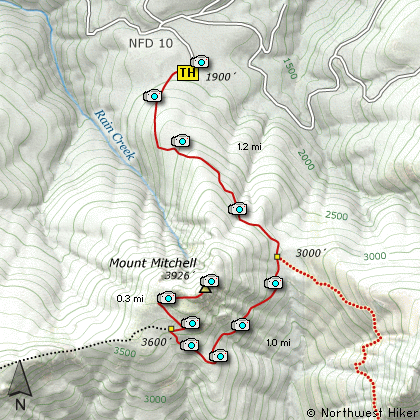 After a couple steep switchbacks, you will begin the final climb to the top of Mount Mitchell. 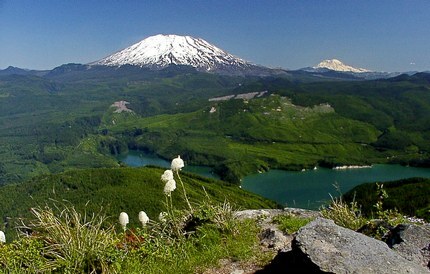 As you walk the ridge line you are treated to fantastic views of Mt St Helens to the north, and Mt Hood to the south. The top of Mount Mitchell is a large rocky knob. The trail works its way up this steep outcropping in such a way that is not dangerous. When you break out onto the top of this peak, you are so rewarded for your efforts that you may not even notice the flood of perspiration running down your face or your heart about to exit your chest cavity. Needless to say, this hike is a real gem. From the junction with I-5 follow SR503 east from Woodland, WA approximately 23 miles to the junction of the Lewis River Road with SR503. Continue east on the Lewis River Road another 4.4 miles to the junction of Forest Road 81 just before you get to Cougar. Continue east through Cougar on the Lewis River Road, which becomes Forest Road 90, 3.9 miles until it intersects Forest Road 10. Make an extreme right turn onto FR10 and follow it for about 4.2 miles and you will see a logging road turn off to the right. Drive up this road for about a quarter mile and this is considered the trailhead for this hike. It was a little hard to discover the trail, but the day I hiked it, there was a pink ribbon on a tree, which led me to the trail. Note: As of the writing of this edition of this CD, Forest Road 10 is gated and closed due to the misuse of the private land by visitors to the area.... hopefully, not hikers.